I trust that you are all well and had fantastic break. May I take this opportunity to remind you about our Occupational Health Mobile Clinic? For those who may not already be aware, our Mobile Clinic is a medical surveillance service that provides examinations and screening tests for workers on site. We believe we are dynamic, flexible and able to meet the individual needs of each of our clients. We pride ourselves on being efficient, effective, yet simultaneously we are saving our clients money. Our Occupational Health Clinic is transforming the way occupational healthcare is delivered. Medicals are conducted onsite in a purpose-built mobile clinic with little disruption to the working day. We service the entire KwaZulu-Natal Province and will also be located at 40 Essex Terrace Westville on Mondays, should you wish to book to have your medicals performed there. 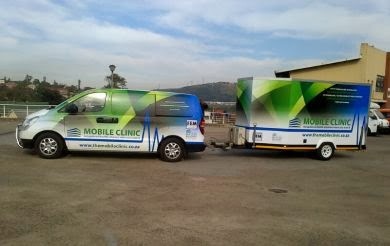 For more information, visit themobileclinic.co.za. I can also be contacted on 083 417 0044.